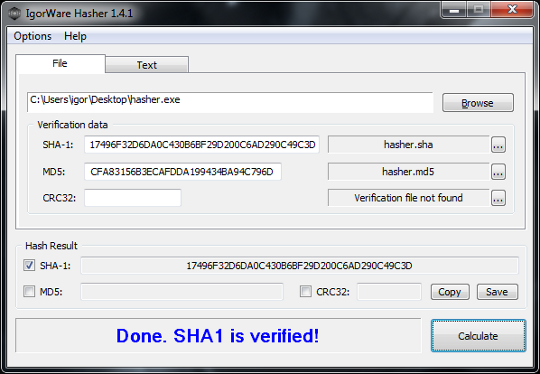 IgorWare Hasher is a free SHA-1, MD5 and CRC32 hash generator for Windows, both 64bit and 32bit versions are available. NOTE: 32bit version can work in Windows 98 and Windows Me if you install KernelEx. KernelEx is compatibility layer that allows running Windows 2000/XP applications on Windows 98 and Windows Millennium operating systems. Hasher is intended to be free of charge, you are not allowed to charge any fee or other compensation for the software. By proceeding to download or install IgorWare Hasher, you are deemed to agree to be bound by the terms of this License.